A new trend study published by Nielsen this week looks into the top smartphone apps of 2016, as well as the operating systems that the apps were downloaded on. This year within the United States, Facebook won the top spot with more than 146 million average unique users each month. The social network company also dominated the second spot with Facebook Messenger at 129 million unique users per month. Following Facebook's winning of the top spots, Google holds most of the remaining spots with YouTube (113 million), Google Maps (105 million), Google Search (103 million), Google Play (99 million), and Gmail (88 million). 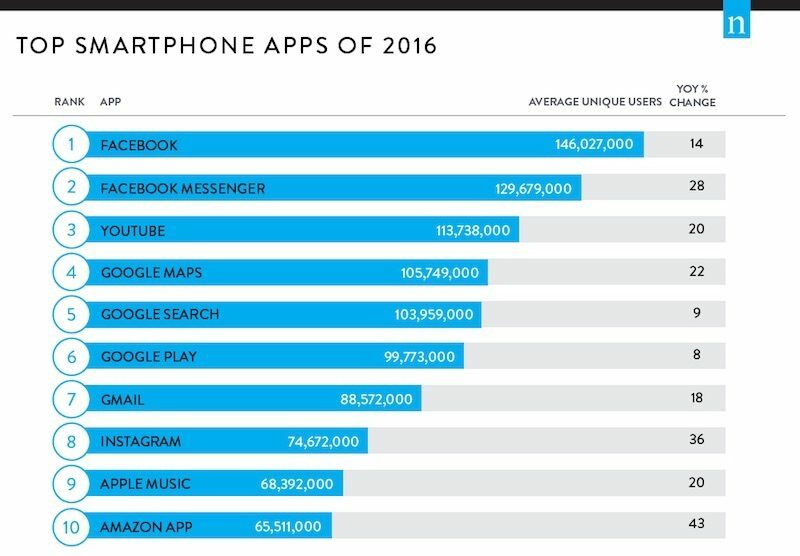 Another Facebook-owned app in the 8th spot, Instagram (74 million), bookends the Google apps. For Apple, the only app that appears on Nielsen's chart is Apple Music, with just over 68 million unique users each month, a growth of 20 percent from 2015. Earlier in December, it was reported that Apple's music streaming service had officially surpassed the 20 million subscriber mark. Amazon's popular shopping app rounds out the list in the 10th spot with 65 million monthly users. In the third quarter of 2016, the apps were opened on average 53 percent of the time on an Android operating system and 45 percent on iOS, according to Nielsen's data of around 9,000 panelists. Windows Phone and BlackBerry accounted for a minimal portion of the statistics at 2 percent and 1 percent, respectively. I'm guessing most people would have guessed at least 7 of the top 10 without any issue. Also, I become a little more shocked every year that Blackberry is still around. 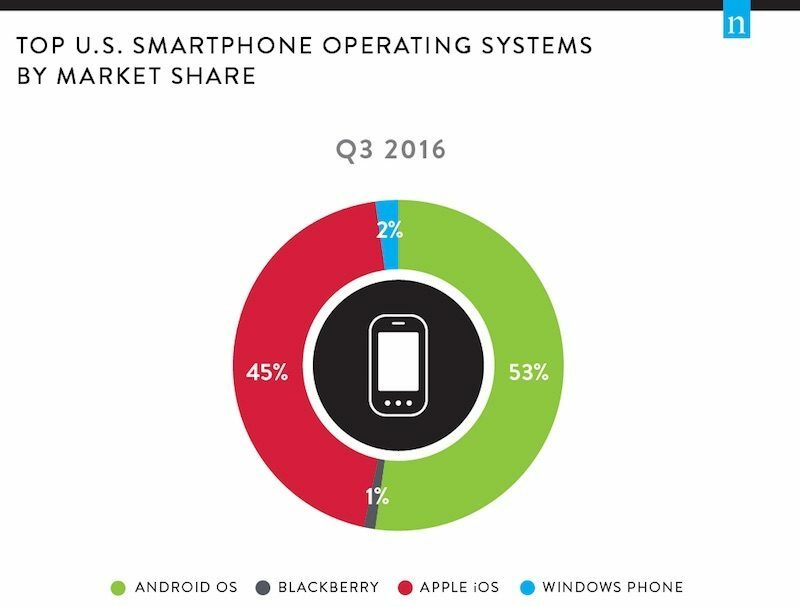 On the positive note, Windows Phone has double the market share of Blackberry OS. You comment reads as some type of conspiracy against Apple is going on? Personally, I only use the Apple Music app to play locally stored files.... do I count as a "unique user" in this data? Because there always is. Why else do they makeup numbers or twist facts like in this article. Google play is not a competitor to Apple Music and they know it. It is a combination of four or five digital services, yet there is no mention of this fact. If it not intentional, I would like to know why these studies always make the mistake to Apple detriment. I call BS. Did you read the actual Nielson report? I got curious and did... they do a huge monthly survey. This method provides a holistic view of all activity on a smartphone as the behavior is being tracked without interruption. Data is based on Nielsen’s monthly survey of 30,000-plus mobile subscribers aged 13 and up in the U.S. Mobile owners are asked to identify their primary mobile handset by manufacturer and model, which are weighted to be demographically representative of mobile subscribers in the U.S. Smartphone penetration reflects all models with a high-level operating system (including Apple iOS, Android, Windows and BlackBerry). Don't use any of the top items. FB, Messenger or any Google App. Got rid of them all. Move everything over to iCloud. Not a fan of being a product and having my personal stuff mined. Got rid of my FB account as well. Serves no real purpose and you can use that "keep in touch" line all you want but if I really want to keep in touch, I'll message you or call. Memory and battery hogs. Agreed on FB and Messenger. Yuck. These two apps actually put me off of keeping in touch with people. I use Google services because half of my phone use is on Android and it's the best option for Android, but I lock down my privacy settings as best I can. They do give you tools to do that but it requires constant vigilance to maintain them. I can certainly understand why someone would avoid Google. I don't know anything about Nielson, but if that's the case, the whole list is irrelevant and unreliable imo. They've been doing this for decades with television ratings, I think they try to select a scientific pool of people, at least to some degree. It would be as good as a drug trial where you seek volunteers and try to build a pool of people that would actually give decent data. Back in the old days, it was using a device attached to your TV (there was a famous Rosanne and/or Simpsons episode about it). If they've adapted to streaming and smartphones etc, I'm assuming it's some kind of app that measures usage. But I'm too lazy to research it. I can't even imagen third parties having a look at the numbers about Apple Music users on iOS. I mean, it's Nielson, so I think you have to volunteer to be part of their studies and you become part of their sampling pool. Not sure how they measure the use, is it like the old TV days where they install something on your device that tracks what you use? no idea..